Everything that is so remarkable, so rich and treasurable, about Chicago’s far-flung storefront theater scene is embodied in American Blues Theater’s resonant and poignant production of Warren Leight’s “Side Man.” It’s a show well worth adjusting the calendar to catch, but it runs only until May 24 and will not be extended. 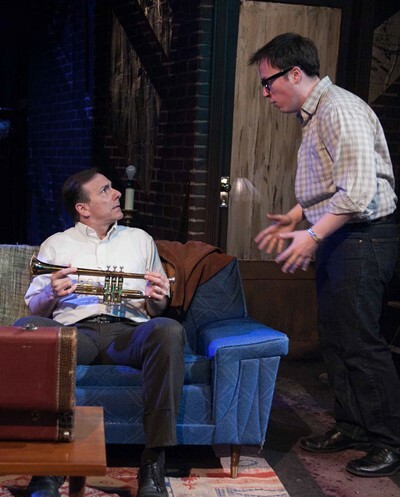 “Side Man,” set in New York City, is the story of a jazz trumpeter, Gene, whose world begins and ends with his horn. The play won the 1998 Tony Award for Leight, the son of a jazz trumpeter who grew up in that milieu and clearly gets its pulse and texture. Gene’s neglected wife Terry, long since withdrawn into the solace of alcohol, is looked after by the couple’s young son Clifford, who – much like Tom in Tennessee Williams’ “The Glass Menagerie” – now recalls that distant time, those growing-up years of pain and bewilderment and singularity. 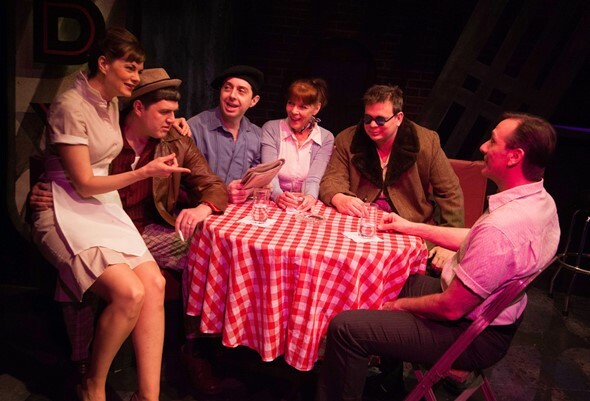 American Blues’ eloquent perspective on the play, directed by Jonathan Berry, exemplifies tight, smart ensemble acting. While it’s the tale of a man, his obsessive commitment to his art and the resulting alienation of his family, it’s also a snapshot of the end of an era – the peaking out and incipient decline of jazz in the years after World War II and the eventual pop music watershed that was the advent of Elvis Presley. The scenes swing (and crash) back and forth between Clifford’s boyhood home and the bar where Gene and his coterie of fellow jazz musicians ply their trade. (Sarah E. Ross’ efficient, adaptable set evokes Gene’s improvisatory lifestyle and allows for fluid transitions.) A side man, in jazz parlance, is a versatile musician who can sit in with a group and play support or step up as a soloist as the situation requires. In the heyday of jazz, a good side man could write his own ticket. So it is with Gene, played with almost Zen-like luminosity by Michael Ehlers. He has a wife and son, but he doesn’t really see them. His eyes and heart, and certainly his lips, belong to the three guys who perform with him, breathe with him, comprehend him in the most profound and connective way. And those musketeers are three more just like Gene: jazz musicians who live for their music. There’s Ziggy (Ed Kross), whose speech is embroidered by a mouthful of lisp; Al (John Gawlik), a rock who’s always on board with the guys; and Jonesy (Joe Foust), the heroin addict with a hip spirit and a droll sense of humor to match. Jonesy may be the most fascinating character in view, and Foust’s earthy, muttering, wry performance all but steals the show. 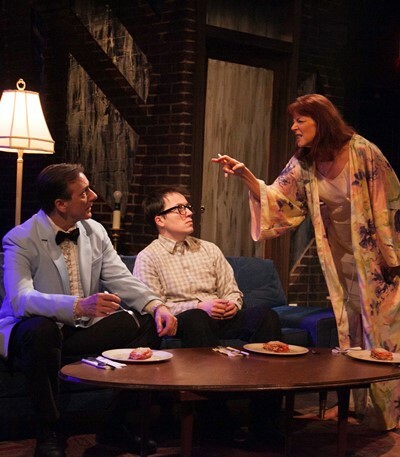 Gail Rastorfer brings charm, insight and a sense of period style to the mix as Patsy, a combination waitress and mother hen at the bar where the guys usually play. Gene’s pals are good musicians, but we quickly grasp what they know and accept, that Gene is something else, gifted in a way that they are not. When Gene launches into a ballad, the room stops. Gene knows he’s exceptional, but that’s not where his head is. It’s not about being the best; it’s about a state of being, of grace –the perfect union of man and horn. Summoning that beautiful sound is what defines Gene, soul and substance. Just ask his wife Terry (Kate Buddeke in a heartbreakingly graphic portrait of wretchedness). Gene surely falls somewhere along the Asperger’s scale. When furious Terry dumps his trumpet from its case onto the floor, he gasps, scoops up the instrument and cuddles it against his body. He’s incredulous, mortified, but he doesn’t get mad. If Gene’s trumpet is OK, he’s OK.
We catch the flashback when Gene and Terry meet at music school. He overhears her practicing on her flute, mangling a tune from Debussy’s “Prelude to the Afternoon of a Faun.” Gene, in the next room, picks up the tune, which he’s never heard, and instantly transmutes it into liquid gold. Terry is smitten. Pretty soon she’s pregnant, and Gene, wanting to do the right thing, marries her. Which pretty much makes him a polygamist, since he’s already wedded to the trumpet. Terry finds herself in a marriage without a mate in any meaningful sense, a life without Saturday nights. Gene always has a Saturday night gig. Even though the jazz game is slowing down, he’s confident he will always get the Saturday call – and if even once he doesn’t, he tells Terry, that’s the day he’ll put the trumpet away for good. He promises. Would it matter? Maybe not. Terry is so far gone, so awash in booze. Our narrator Clifford – Gene named his son after the great trumpeter Clifford Brown, whose brilliance was snuffed out in a car crash when he was 25 – remembers in detail Terry’s raging eruptions, incited by Gene’s neglect and fueled by hard drinking. She rants at the 10-year-old boy because he hasn’t restocked her liquor cabinet and tomorrow is Sunday. What’s she supposed to drink? But then, Gene expresses great surprise when little Clifford reminds him that he’s 10. No! Where did the time go? Somehow, non-judgmental Clifford (Michael Mahler as the benign, even-handed narrator) survives and grows up, taking care of – if also enabling – his besotted mother the whole time. When the play opens, he’s taking leave of her and hoping to see his long-absent dad once more before walking away from it all. Great horn player, Gene. And Clifford understands and admires that. Terrible husband, hopeless father. Clifford knows all that, too. But he still wants to tell him good-bye. How wonderful and lasting it would be if, just this once, his father really saw him.